Research reveals some figures the NRA would rather us not know. The NRA is scrambling to defend their arcane perspective on guns and the Second Amendment in the wake of recent mass shootings and the efforts of the March for Our Lives movement. A change in America’s approach to gun violence is long overdue and possibly most disturbing is the fact that the warning signs have been clear all along. For instance liberal commentator Mark Shields made an incredible claim in the wake of the December 14, 2012 Sandy Hook Elementary School shooting when 20-year-old Adam Lanza fatally shot 20 children between six and seven years old and 6 adult staff members. Two Internet-accessible data sets from the Centers for Disease Control and Prevention allow us to pin down the number of deaths from 1981 to 1998 and from 1999 to 2010. We’ve added FBI figures for 2011, and we offer a number for 1968 to 1980 using a conservative estimate of data we found in a graph in this 1994 paper published by the CDC. The NRA and pro-gun crazies have been spouting statistics for their cause, in fear, since the Sandy Hook massacre. Liberal/Pro-GunSense groups have given their own figures. Who wins? Nobody. The study is devastating, and proves America has sorely lost, is losing, and will continue to lose, until laws are changed. This sobering and poignant information needs to become known to every U.S. citizen. And we need to demand action. Thank you, Mark Shields. Thank you, PolitiFact for the research. Sadly, the gun epidemic continues – with the help of the NRA and politicians willing to accept their blood-money donations. [A] study based on data from 2012 to 2014 suggests that, on average, 5,790 children in the United States receive medical treatment in an emergency room each year for a gun-related injury. About 21% of those injuries are unintentional, similar to the third-grader’s case. When people think of gun violence, they might think of large-scale mass shootings like the one in Las Vegas on Sunday, in which 59 people were killed. But of the approximately 33,000 gun violence deaths that take place each year, only about 500 (or 1.5%) come from mass shootings. Two-thirds of gun violence deaths are from suicide. What doesn’t this [data] show? 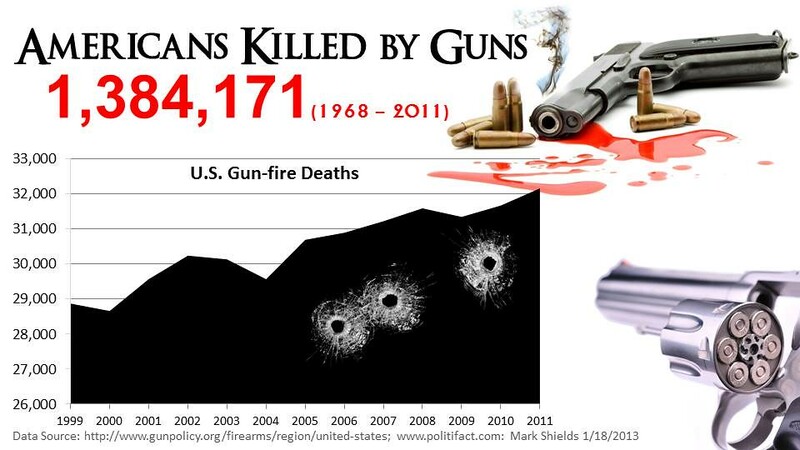 The more than 70,000 people who are injured by guns each year. Data from the U.S. Centers for Disease Control and Prevention (CDC) show that on an average day, 96 Americans are killed with guns. On average there are nearly 13,000 gun homicides a year in the U.S.
Nearly two-thirds (62 percent) of firearm deaths in the U.S. are suicides. Seven children and teens (age 19 or under) are killed with guns in the U.S. on an average day. In an average month, 50 women are shot to death by intimate partners in the U.S.
Background checks are a central component of America’s efforts to keep guns from criminals: since their inception, they have blocked over 3 million gun sales to prohibited purchasers.